Precision storage from Quantum. Dividable Grid Containers can be configured to your specifications, then securely stacked on units sized to hold the bin models provided – so there’s no wasted space in the containers or on the shelves. Four configurations available. Each includes a wire shelving unit and the size and number of Dividable Grid Containers listed in the table below. High visibility and air flow from all sides. All-welded construction and a durable chrome finish. WR12-93030CL and WR9-93060CL capacity: 600 lbs. per shelf. WR7-92080CL and WR9-92060CL capacity: 800 lbs. per shelf. Bins are available in Blue, Gray or Red. NOTE: Bin Dividers are sold separately. Optional Mobile Kit, Donut, Clear Snap-On Covers, Colored Snap-on Covers, Clear Label Holders, Clear Dust Cover Inlays and Dividers also available. Please see Options tab for details. Protect contents from damage or dust during shipping and storage. Available in carton quantities only. Priced per carton. Available in Blue, Gray or Red. Available in cartons of six only. Priced per carton. Fits any size container. Available in three sizes. Maintain visibility while protecting against airborne dust and other contaminants. Cover lays on the recessed rim of the container. Create custom compartments to fit small- and medium-sized parts in your Dividable Grid Containers. Just slide these dividers into the molded-in slots and easily rearrange them whenever you need. 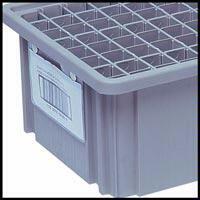 Divides containers by length and/or width, allowing subdivision down to a 1-1/8" square compartment size. 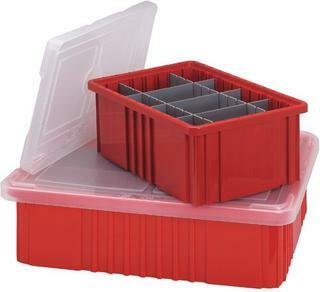 Creates uniform or multiple sizes of compartments within one container. easy to access at the same time. Slotted for easy interlocking – no tools or hardware required.